I fear that LawBreakers will become a victim of unfair comparisons that misrepresent what it is really all about. At a glance, you’d think this is a pretty forgettable shooter, coming from a un-tested development team, with a generic looking science fiction aesthetic, broad design and interface elements that seem suspiciously similar to Blizzard’s runaway hit Overwatch, but with less of the personality and pedigree that propelled that game so effortlessly towards success. However if you spend some time with LawBreakers, this comparison quickly melts away, replaced by the realization that this first-time effort from Boss Key Productions has more in common with old-school arena shooters ala Quake, and is in fact quite a lot of fun. 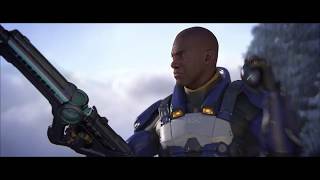 Even though LawBreakers might be dressed up as a team-based or role-based game, it relies far more heavily on individual player skill than most games in this genre. Though there are nine highly distinct roles, having a team with a well balanced mix of classes won’t matter if the individuals don’t have good aim and haven’t got to grips with the unique and challenging movement mechanics. 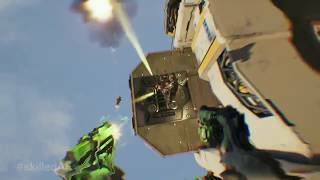 If there is one thing that sets LawBreakers apart it’s the movement mechanics and zero-gravity sections of the map. Regardless of the mode, each map has normal gravity around the edges or team spawn areas, and a zero-gravity zone in the middle. Learning how to take advantage of the different gravity, as well as the class-specific movement abilities, is a rather unique learning experience, somewhat challenging but also gleeful. The other defining aspect of what makes LawBreakers successful is the diverse set of classes that, in addition to unique weapons and abilities, all have their own special method of getting around the environments. For movement, many classes have some form of jet pack that lets you propel yourself forward, upward or hover, though some heavier classes such as the Titan and Juggernaut are significantly less mobile than the lighter ones. One unique mechanic that any class can take advantage of is the ability to blind-fire behind you while moving ahead. Not only does this allow you to fire on enemies who are chasing you, but firing backwards while in zero-gravity propels you forward and allows you to gain additional speed. Zero-gravity areas also have gravity wells which can be used to change speed and direction, though learning how to use these effectively is not easy. Though the classes are all unique, all of them are capable of dealing good damage in combat. Even the two medic classes Harrier and Battle Medic have access to high-powered weapons that make them potent in a fight, and as someone who generally avoids playing healing classes these ended up being two of my favorites. Other roles have access to a wide variety of weapons including machine guns, rocket launchers, submachine guns and even melee weapons, though notably there are no sniper rifles. The melee/short range classes are particularly interesting, with the Assassin sporting a grappling hook and dual-swords that encourage getting in close to do some nasty damage. No matter what class you pick, there will be a significant learning curve. The classes that have more traditional firearms require players to be able to aim effectively to hit moving targets at a variety of ranges, and are ideal in low-gravity situations where it is possible to stay in the air where you are relatively safe from projectile based weapons like rocket-launchers, and difficult to reach by melee players. Melee or short range classes must find ways to close the gap between themselves and opponents, meaning they might be better suited to more advanced players who have a better handle on the movement system. The user interface is largely identical to Overwatch, where abilities such as grenades or healing powers appear in the bottom left with individual hot-keys and cool down timers, and you can press F1 to get an overview of each classes’ weapons and abilities. Still, no matter what class you gravitate towards, you can expect to die a lot early on. Perhaps LawBreakers’ biggest failing is that it gives you poor tools to help make the steep initial learning curve smoother. There is a sandbox level you can run around in as any class with a few static enemies to test abilities on, but apart from this and some generally unhelpful tutorial videos you will need to cut your teeth against human opponents. While the glee of whooshing around in zero gravity was enough entertainment to keep me going until I had a handle on the basics, I suspect many players will be turned off by unpleasant first impressions caused by having to play with and against more experienced players. The inclusion of bots for custom games, or some kind of co-operative mode would have gone a long way here. The initial challenge faced by new players is exacerbated by the extremely simplistic matchmaking that does not appear to take player skill into account at all. Unless you are setting up a custom game for yourself and some friends, you are funneled into a single ‘quick play’ matchmaking queue that places you into one of five 5v5 modes, and with such a low player count a single skilled individual can pretty much dominate an entire match. One-sided games are common and being on the wrong side of a skilled team can be a miserable experience. On the few occasions I did get into very close matches, the game soared and I struggle to recall the last time I had so much fun with a fast paced online shooter like this, underlining the necessity of some kind of ranked matchmaking that produces more even games. To its credit though, the current matchmaking has been consistently fast and always placed me into low ping servers. The modes themselves are less remarkable than the gameplay, but do a good job of creating focal points for action that usually move around the map. Though there are five modes, two of them dubbed Uplink and Overcharge are very similar. These modes require both teams to fight over a single item that they must capture, bring back to their base and defend while a meter fills, eventually resulting in that team scoring a point. In Uplink, the meter fills separately at each team’s base, while in Overcharge, the meter is tied to the device itself, allowing one team to fully charge the battery only to have the other team steal it at the last second and score the point for themselves. The other modes are Blitzball, where both teams compete to grab a single ball and get it to a goal at the opponent’s end of the map, and a couple of variations on territory control that would feel right at home in a Call of Duty game. Even though I ended up liking all of the modes and don’t have a problem with all of them being mixed into a single playlist, not all of the modes work well with all seven maps. Blitzball in particular can be problematic, as the distance between the location where the ball spawns and the goals can be very short, and a skilled player using one of the more mobile classes can grab the ball and score in a couple of seconds, before the other team can react. The maps in general are adequate but none blew me away, and the bland art direction makes them all feel somewhat indistinct. Bland is also the word I would use to describe the game’s cosmetic unlockable items. One place where Overwatch comparisons do make sense is when talking about LawBreakers’ progression system. You level up your character, but the only unlockable items are cosmetics which you get by opening crates you receive when leveling up, with in-game currency or by spending real money. Apart from weapon skins which you see clearly when playing, player cosmetics are hardly noticeable in-game as everyone is flying around at high speed and opponents have a red aura that makes noticing their skins difficult. Forgettable art direction aside, the game looks good from a technical perspective, with Unreal Engine 4 producing good quality textures and lighting in the generic futuristic environments. Performance I found to be excellent, with short load times and seemingly fine net code and stable servers resulting in good hit detection. The audio design is quite good, with meaty sounding weapons and distinct audio effects for abilities. The electric-guitar driven music that comprises the original soundtrack is fine but unremarkable. When it comes down to it, LawBreakers is a game that rewards individual skill above all else, and if you are the kind of person who becomes frustrated by teammates performing poorly in a team-based game, this kind of focus on solo talent could be a huge plus. 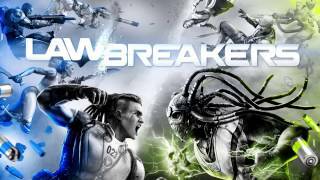 On the flip side, if you struggle with aiming in fast-paced shooters or dislike the idea of some potentially frustrating matches as you learn the mechanics, LawBreakers might be best avoided. The bottom line is that the game is a rock-solid shooter with some neat ideas and lots of exciting moments awaiting those who get to grips with the unique movement and flow of combat. Technically proficient visuals can’t make up for bland art direction and player skins you probably won’t even notice. Audio design is strong, though the soundtrack is forgettable. The movement system and zero-gravity combat feels fresh and exciting, and each of the classes are distinct and fun to play. A steep learning curve and lack of good practice options outside of PvP are a problem. Seven unremarkable maps and five good modes are all mixed into a single matchmaking lobby that doesn’t take skill into account and often produces uneven games. Custom game support exists but without bots is of limited use. Great performance all around with quick matchmaking and good netcode.